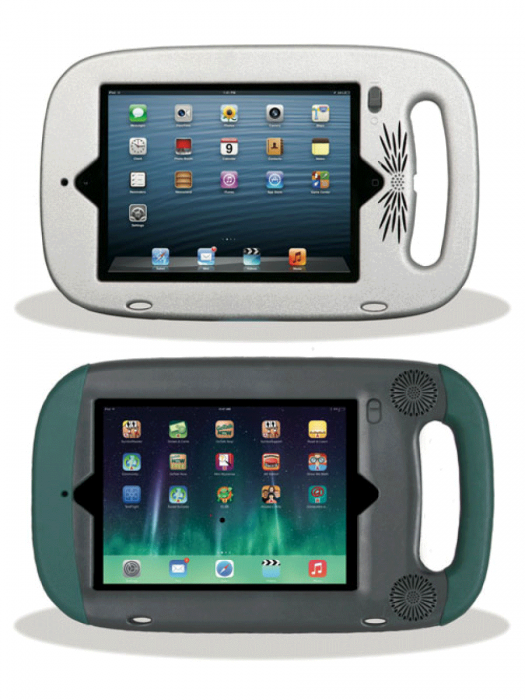 GoNow mini Cases (for original mini, 2, 3 and 4) are built for special education. The built-in handle makes the iPad mini much easier to carry. High-impact exterior and soft plastic interior protect the mini from the knocks and drops of everyday life. Plus our patent pending design significantly increases the iPad mini's audio clarity and volume. It's three times as loud! We channel the iPad's audio through a sound chamber and redirect it forward to yield a richer performance. There's also a switch that controls the iPad's magnetic on/off feature and two pass-through ports for a shoulder strap. Of course, you get access to all of the iPad's controls, like the charging dock, camera, volume and headphone jack. There are two styles for iPad mini's original, 2, and 3— GoNow Sleek Case for iPad mini and GoNow Rugged Case for iPad mini with rubberized edging. For iPad mini 4, only the GoNow Rugged case style is available. GoNow Sleek Case for iPad mini, in silver only, is available separately and in a GoNow Sleek Complete Package for the iPad mini that includes the Case, a Screen Protector and Shoulder Strap. 2 year warranty on Case. GoNow Rugged Case for iPad mini has rubber edging on the top and bottom, plus a molded rubber pad in the interior. This further increases shock absorption and provides a more secure handle grip. The Rugged also has fold-out feet to add a slight elevation when lying flat — ideal for keyboarding. The GoNow Rugged Complete Package for iPad mini includes the Case, a Screen Protector and Shoulder Strap.